"Two gentlemen came out of the woods, one holding a baseball bat, and said 'You're coming with us'." The men weren't deterred by Dinah's dog Gracie. "I said, 'Well, what do you want?,' and as I was saying that I reached in to my pocket and slipped my gun out, slipped the safety off as I pulled it out. As I was doing that the other gentleman came toward me and raised the baseball bat. And, I pointed the gun at them and said, 'I have this and I'm not afraid to use it.'" A jury found a Duncan physician not guilty on Friday of assault and battery with a deadly weapon in the shooting last year of his ex-wife’s boyfriend. McKinnon and Rachel Morales testified they did not provoke the violence. Defense attorney Garvin Isaacs introduced photograhic evidence that showed the doctor was heavily bruised after the incident to bolster his contention that was a full-fledged altercation preceding the gunfire. There will be a gun turn in event in Cleveland, Ohio on Saturday, 6 September, 2014. While these events are commonly labeled with the propaganda term "buyback" the guns were never owned by the people attempting to buy them. At the handgun buyback event, people can exchange guns for gift cards, no questions asked. The guns are tagged and checked and eventually melted down. There is no hint of objectivity by Newsnet5.com. They are actively promoting the event. There would not be a problem with this if the event were politically neutral. The event obviously is not. It promotes the idea that guns are bad and should be destroyed. 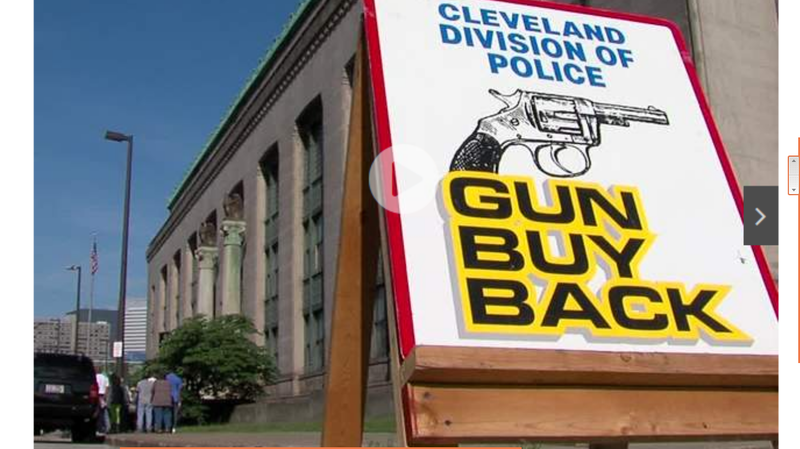 Between noon and 8 p.m. today, we are holding a phone bank to help the Cleveland Police Foundation raise money for the Foundation's handgun buyback event set for Saturday, September 6. The phone bank phone number is 800-658-5370. I bought a Colt Agent revolver last year in almost new condition. I believe a Python was purchased also. After some initial friction last year, the police recognized the right of private buyers to be there. Yup, a bit of an interaction in the morning as they got their crap together, then we were free to operate. One of the officers was actually reassuring citizens bringing in guns that they could sell to us without issue. CLEVELAND - The 2013 City of Cleveland Gun Buy-Back was held Saturday, June 15 at Public Safety Central on Payne Avenue. 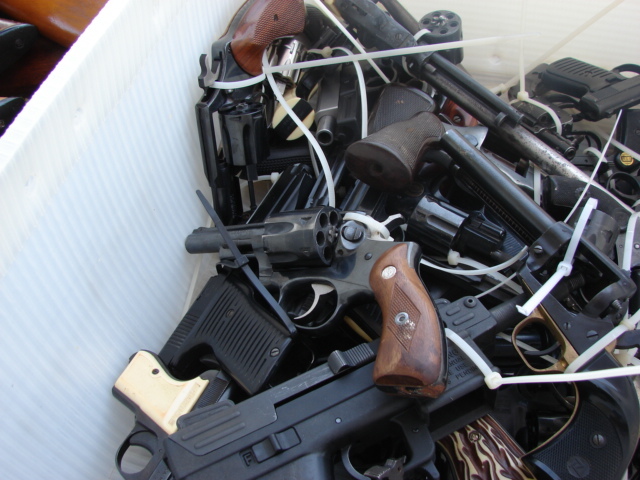 In all, 352 firearms (311 handguns and 41 long guns) were surrendered to police. In exchange for operable handguns or semi-automatic rifles (Assault Rifles), citizens were given a either a $100 (handguns) or $200 (semi-automatic rifles) Target, gas or food gift card and two tickets to an upcoming Cavaliers and Lake Erie Monsters game. In addition, they were entered into a raffle with a chance to win up to $1,000. You might want to read the insider story by private buyers in Jacksonville Florida to see how things were handled there. Be prepared for a percentage of people who refuse to talk to anyone but police. All the private buyers that I saw at gun turn ins were polite and let ideologically driven people turn in their guns for a fraction of what they would be worth on the open market. Signs are helpful, as are good grooming, cash, and a friendly attitude. Dale Carnegie's advise for dealing with people works very well. Risks of purchasing stolen guns are small. You can read about them at this article. This action serves many useful purposes. It stretches the turn-in budget so that more guns can be taken off the street. It helps keep fearful widows from being defrauded of most of the market value of the gun they are turning in. It prevents valuable assets from being destroyed by bureaucratic inflexibility. It is a win-win-win situation. The ideal situation for those organizing the turn in would be to allow private buyers to purchase the valuable guns, while having the organizers take the cheap guns "off the streets". As these events are ideologically driven, that seems unlikely, but it might be worth an attempt at outreach. All parties would benefit. Private buyers dispel the pernicious message that guns are bad and should be destroyed. Houston police said an armed convenience store clerk not only foiled an attempted robbery, but wound up putting the would-be robber in the hospital. Police said the man was shot in the neck while trying to rob a convenience store at the intersection of Almeda-Genoa and Rowlett. "When I saw the gun I felt like I was going to die. For my safety I had to pull my trigger," said store clerk Kiran Giri. Castle Rock, Colorado sits on the urban corridor from Denver to Colorado Springs. It is primarily a bedroom community to Denver that has had explosive growth in the last 30 years, form 3,921 in 1980 to 51,348 in 2012. In 2003 the Town Council gave the Town Manager, who is appointed by the Council, the authority to ban the open carry of firearms on town property. In 2014, the Council voted to remove that authority. The current Town Manager, Mark Stevens, had prohibited open carry on Town property. What resulted were two initiatives; one to approve of the action of the Town Council, (put forward by those opposed to it - a "no" vote would reverse the decision), and another to remove the power to regulate firearms from the Town Council and to requiring a referendum on all future firearms issues. Second Amendment advocates recommended a "Yes" vote on both issues. The election process was hotly disputed, with at least two lawsuits and concerns over the counting of election results. Second amendment advocates claimed that many election safeguards were disregarded by officials who reported to the Town Manager. The election was held on 19 August and the results certified on the 29th of August. The election turnout was reported to be the highest in City history. This is due to a combination because of city growth, the new Colorado election laws that require a mailing of ballots to all voters, and because of the nature of the questions. SHALL TOWN COUNCIL ORDINANCE 2014-03 BE APPROVED WHICH ORDINANCE REVOKES THE AUTHORITY OF- THE TOWN MANAGER UNDER THE MUNICIPAL CODE TO PROHIBIT THE OPEN CARRYING OF FIREARMS WITHIN MUNICIPAL BUILDINGS, PARKS, RECREATION AREAS AND OTHER MUNICIPAL PROPERTIES OWNED OR OPERATED BY THE TOWN OF CASTLE ROCK? SHALL THE TOWN OF CASTLE ROCK HOME RULE CHARTER BE AMENDED BY ADDING A NEW SECTION 1-5 TO READ AS FOLLOWS? Any restriction or limitation on the rights of citizens to keep and bear firearms enacted by the Town Council shall require the approval of the registered electors as a referred measure under Section 15-4 of this Charter. This Section shall not apply to Town Council action which makes unlawful the discharge or brandishing of firearms. This Section shall govern and control over Articles II and VII or any other conflicting provision of this Charter, and shall apply only to Council action taken after its adoption. Both results were in favor of second amendment advocates, both initiatives passed. Measure A, which approved of the Town Council removing the authority of the town manager to restrict open carry, passed by 50.8% of the vote, 4,737 to 4,586. In the Old West, the handgun, shotgun and rifle were important tools for self-defense and survival. Being proficient with a weapon was important. Being proficient with a weapon while riding a horse was even better. On Thursday at the Nebraska State Fair, modern-day cowboys, some of the best riders and shooters in the state, gathered for a cowboy mounted shooting demonstration and competition at Thompson Arena. Cowboy mounted shooting has a historical link to shooting and riding demonstrations featured in the wild west shows of the late 19th and early 20th centuries. Buffalo Bill Cody’s Wild West Show once performed in Grand Island. The Border Patrol has had strict policies about the firing of weapons for decades. In the most famous recent case, Border patrol agent Brian Terry was killed in a firefight in which the Patrolman used less lethal "bean bag" rounds. Border Patrol agents I have talked to have always said that the mere presence of a weapon is not enough to justify shooting at someone. This makes sense, because most people in the United States can legally possess weapons, and because the law is clear on what is required to justify the use of deadly force. The mere presence of a weapon is not enough. In border areas, where there is often rampant criminality, many people consider it foolhardy not to be armed. The Arizona Supreme Court recently reiterated this maxim, when they ruled that the mere presence of a weapon is insufficient to allow a person to be detained. Border Patrol spokesman Omar Zamora said agents had been chasing a group of immigrants east of Brownsville Friday afternoon when an agent saw a man holding a gun near the Rio Grande. The agent fired four shots, but did not hit the man. The totality of the circumstances must be taken into account. In this case, the agent was pursuing a group of illegal aliens when he saw the armed citizen. However, the citizen never made any threatening moves, and never pointed his long gun in the direction of the agent. Perhaps the shots were meant as a "warning". I do not believe that this is Border Patrol policy, as it is a good way to instigate a gun fight. The citizen in this case immediately dropped his weapon. He very likely had seen the agent coming in his direction and knew that the person firing at him was a member of the Border Patrol. I suspect that the Border Patrol agent will be in a lot of trouble for this breach of protocol. He is very lucky that he did not hit the armed citizen, who was on private property, who had permission to be there, and who was not reported as doing anything wrong or illegal. On or about Wednesday 27AUG14 at approx 18:00 Archie, a fellow teammate at Camp Lonestar, met Mr Aguliar curator of the wildlife sanctuary located on the Texas Border at a Gas Station named “Stripes”. After speaking with Archie, Mr. Agulair showed interest in having us patrol the sanctuary due to illegal alien incursions onto his property. He invited us to come speak with him. On 29AUG14 at approx. 14:00 We (KC, Wolf, Jesus) went to speak with Mr. Aguliar about patrolling his property. After agreeing to his terms for patrol on his property, we set out to scout the new property along the river. After we cleaned up 3 crossing spots(we remove refuse to beautify our state and to allow us to monitor new traffic) we observed a dismounted Border Patrol Agent walking down the river road. We knew from working with BP when they are dismounted they are actively looking for illegals that have crossed into US territory. I approached the Agent and asked him what was going on. The BP agent informed us that they had illegals being pushed toward our location from other BP agents. We asked if we could help him and he said yes. We heard voices coming from the river so we deployed to the river approx. 75 yards apart, which was to the rear position of the BP agents position to cover his back. Wolf took the most Northern position I assumed the middle position and Jesus was in the southern position. While I was in a covered position on the river I observed a heavily tattooed late 20′s early 30′s Hispanic male hollering and whistling up and down the river. While observing suspect I heard a series of approx. 5 gun shots ring out. My first impression was, it was the cartel flexing their might to attempt to intimidate us as they had done previously to BP. I observed suspect until he got out of my visual range. When I went back up to the top of the ridge to reposition myself to further observe the suspect, my teammate Wolf informed me a BP Captain was looking for me. I immediately proceeded to meet the Captain on the border road. I observed the BP Captain coming toward me holding the AK Pistol Jesus was carrying and Jesus following behind the Agent. When the BP Captain and I got within speaking range he informed me that one of his agents discharged his firearm at my teammate(Jesus) approx. 5 times. He stated to me his agent mistook our teammate as an illegal and saw the weapon and he opened fire without provocation or without ordering Jesus to drop his weapon. I then observed the Agent who discharged his weapon and he was visibly shaken. 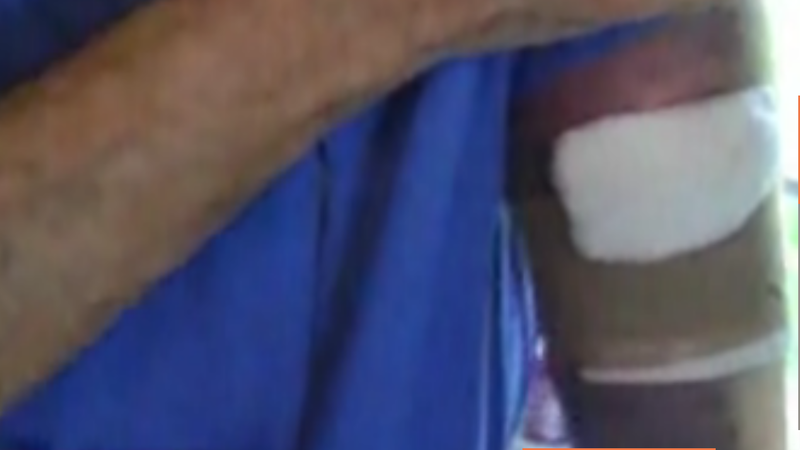 His skin was flushed and his color appeared to be white. After about 20 minutes the Agent was back to a normal darker skin tone. The BP Captain then asked us to move out of the “HOT” zone for our security to further discuss the incidental discharge. We agreed and moved approx. 250 yards from the site of the shooting. When we arrived at the new location the BP agent chose, we stopped approx. 30 yds. behind his vehicle. I disarmed and stowed my side arm in the glove box of the mule and left my rifle leaning on the gun rack mounted to the mule. Wolf left his rifle laying on the back seat of the mule and we dismounted. Wolf retained his pistol concealed under his blouse. We then approached the BP Captain and continued to discuss the incident. After approx. 15 minutes BP agents started to gather at our location to secure the scene for the ensuing investigation into the discharge of the BP agents firearm. The BP Captain asked us if he could secure our weapons since we did have illegals in the area and we were not in a position to protect the weapons from being used against us by an illegal. We consented to him securing the weapons in his vehicle. The BP Captain also took possession of my GoPro camera that was mounted to the mule. After approx. 45 minutes a Charge Sargent of the Cameron County sheriffs office arrived and took possession of our identification and he proceeded to run our names and backgrounds. He also ran the numbers on our weapons which all came back clear. I had to scratch the paint off of my AK pistol for the BP and deputy to obtain the serial number. He also ran the VIN of my mule which was clear. Shortly afterwards top ranking Border Patrol commanders and investigators arrived. The FBI and Homeland security investigators arrived on the scene. I was questioned by Homeland Security agent and an FBI agent about what I knew and observed. I answered all questions posed to me truly and accurately. After approx. 5 hours being detained by Federal and county officials we were told we were free to go. While we were waiting for our identification back we observed the Deputy Sheriff taking possession of our weapons. When I questioned why he was taking our weapons after they were cleared as not stolen and we had every legal right to possess them on the private property we had permission to be on, I was informed they were “Part of the investigation” into the discharge of a weapon by a federal agent. I again questioned why our weapons were part of an investigation that we had not committed and wrong doing. The Deputy asserted he was told to do so and I could retrieve my weapons Monday 1SEPT14 at the Sheriffs office. I was not given an inventory list of the weapons being held nor for my GoPro camera they refused to give back due to their investigation. I was just told to go to the Sheriffs office next week. The SSG with the Cameron County sheriffs office returned our identification and told us we were free to go. Again I asked about my weapons and camera and again I was refused access to my lawful property. We mounted up on the mule and departed to our base camp. The statement reported by AP is completely false. We never identified ourselves as “Militia” as a matter of fact we all stated we are NOT Militia just Concerned Patriotic American Citizen here to help protect and serve our fellow Americans being victimized by these illegals aliens and support the Border Patrol in the deterring of illegal incursions onto American soil. David Codrea hits another one out of the park with this article. I thought the NYTs could not drop its credibility about guns and gun laws much lower. But with the editorial that David writes about, they succeed. "Will a Gun Retailer Get Away With Negligence?" Teresa Tritch of The New York Times asks. That headline is significant for two reasons: First, because it very publicly presumes a defendant in a contested civil lawsuit is guilty of negligence. By all standards of objective journalism, even suspected murderers everyone "knows" are guilty are referred to as "alleged" killers until verdicts are rendered. Second, because Tritch is a 10-year member of The Times' editorial board, writing her piece for "Taking Note," the paper's "editorial page editor's blog." Police received a report of shots fired in the 11000 block of Dedham Drive around 3 a.m. Detectives said two or three men were trying to break into the home. The homeowner struggled with the men over a gun and shot one of the suspects. A woman and small child inside the home at the time were not hurt. There are bullet holes in the home's front door and blood on the front porch and driveway. Police Chief Fred Posavetz saidthat shortly before 1 p.m., a Garda armored car security guard was entering the bank at 37370 Gratiot when he was accosted by a robber. In the exchange of gunfire, the guard also shot a getaway driver who was sitting nearby in a stolen minivan, Posavetz said. Police found the silver Town and Country minivan unoccupied on a side street just north of the bank. A bullet hole was found in the passenger front door and blood was on the driver’s seat and steering wheel. A pastor of an Algiers church shot and wounded a 50-year-old man Wednesday in a reported burglary, New Orleans police and relatives of the pastor said. The Rev. W.L.T. Littleton fired on two burglary suspects, striking one in the head outside the Greater Morning Star Baptist Church on Vallette Street, according to relatives and church members who gathered at the scene and a brief police statement. Craft said the homeowner, who has not been identified, told investigators that a man began beating on the front door, and when he opened the door the man forced his way into his house. The homeowner said that when he pulled a gun on the man, he fled outside, but he still refused to leave the property, and then began to move toward him in an aggressive manner. 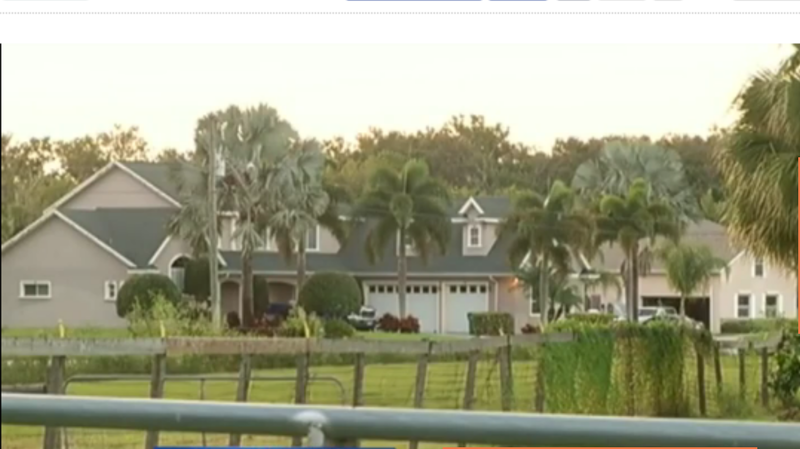 The homeowner then opened fire, striking Fernandez four times. Cows are large, powerful animals. They can easily weigh 800 lbs. If they want to hurt you, they have the means to do so. The deputy says he got to his feet just as the cow was charging a second time, and was forced to shoot and kill the animal to avoid a second blow from the cow. The deputy's injuries are not life-threatening. The Utah municipality of Sandy City has agreed to stop violating state law. The city had passed ordinances that were clearly in violation of state law. Nearly all states control what power is granted to cities. State power is granted by the Constitution, and constrained by it, as is federal power. Most states have reserved the power to regulate guns to the state level, so that there will be uniform gun laws throughout the state. Utah is one of the vast majority of states that have a preemption law that does this. "Sandy City Corporation has no legal authority to adopt or enforce these sections of the Sandy City Corporation Code and should, out of respect for the supremacy of the Utah Legislature, and out of respect for the rule of law, repeal them," foundation Executive Vice President Alan Gottlieb wrote in a July 8 letter to the city. Only one member of the public spoke against repeal of the ordinances. "Where are the laws protecting my rights as a private citizen who does not feel safe anymore, anywhere?" said Sally Jo Fuller, a 45-year Sandy resident who was the only member of the public to speak against the amendments. If Ms. Fuller had thought about her comment, she would realize that her proposed "right" would cancel all other rights. If one can stop anyone from exercising their rights by claiming that a person " does not feel safe", then no right would be safe. Anyone could claim that the way a person talked, or dressed, or practiced their religion made them feel "not safe". When he went to chase the raccoon off the porch, it turned toward him, making noises and "not acting right," according to police. So he shot the animal twice and called police. Spartanburg Animal Services removed the raccoon, which tested positive for rabies on Monday, police said. OKEECHOBEE — A man’s quick thinking and shooting ability saved his neighbor from a possible attack by two aggressive pit bulls, indicated a deputy’s report. About that time Mr. Sperry’s neighbors, Pete and Susanne Clemons, arrived home. By this time Mr. Sperry was armed with a .22 caliber rifle. As Mr. Clemons stood by his vehicle two of the more aggressive pit bulls turned their attention toward him. As a grey pit bull started to lunge at Mr. Clemons, Mr. Sperry took aim and killed the animal with one shot. DOVER - Authorities dropped charges Tuesday against a 32-year-old man accused in connection with the second of two shooting deaths in Dover on Sunday. "I was sleeping in, trying to get my rest. I heard the door bell ring. I'm like, who is this? I hear a strong knock. I'm like, something going on. I get up, I hear stuff at the door, I'm like, something is happening. I went and got my gun," said Quinton Wood. All I know is, I'm telling him, get down, stop. It went bad. He kept coming toward me and didn't want to stop," said Wood. 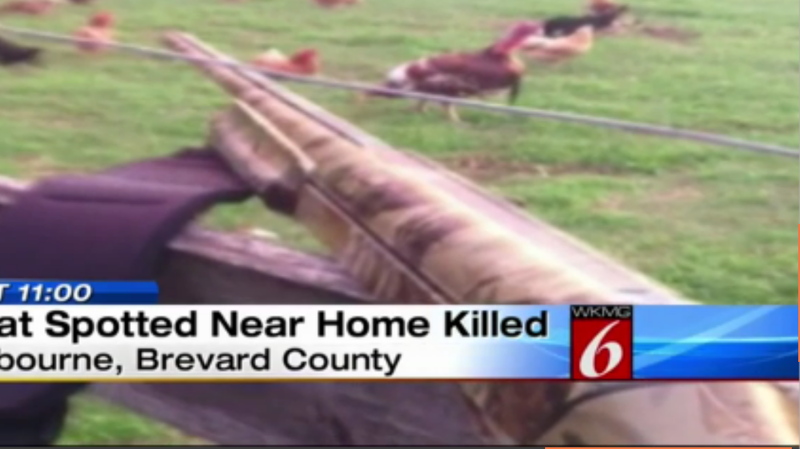 Deputies said Wood shot 25-year-old Avery Powell in the chest once. Powell was shot inside of the home, on the front door step. Wood said Powell kept begging to make a phone call. Two suspects in a cell phone robbery were chased down and one of them shot at a Fiesta grocery store in northwest Houston. There is no word on what if any charges the suspect or the gunman will face. About 2:30 a.m., two burglars broke into a woman’s home, then stole her blue Toyota Highlander, last seen going east on Exposition Avenue. The woman apparently got scared and fired at them while they were still outside. “Obviously she felt threatened so she took some measures,” said Sonny Jackson, Denver police spokesman. The suspects fired back, and one of the bullets ended up hitting a neighbor’s SUV and smashing the back windshield. 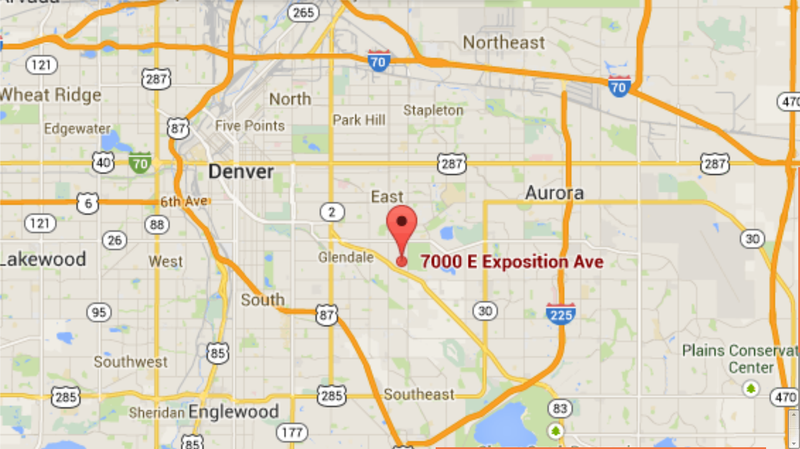 Marquies Jackson was a suspect in the incident, in which two people reportedly broke into a home in the 7000 block of East Exposition Avenue about 2:30 a.m. Monday morning, the Denver Police Department said. I suspect that Marquies is still a suspect. Marquies is 18 years old. The blue Toyota Highlander has not yet been recovered. Surveillance video shows the suspect approach the counter, pull out a hand gun, and start waving it around. Patel then reaches under the counter and pulls out his own gun. 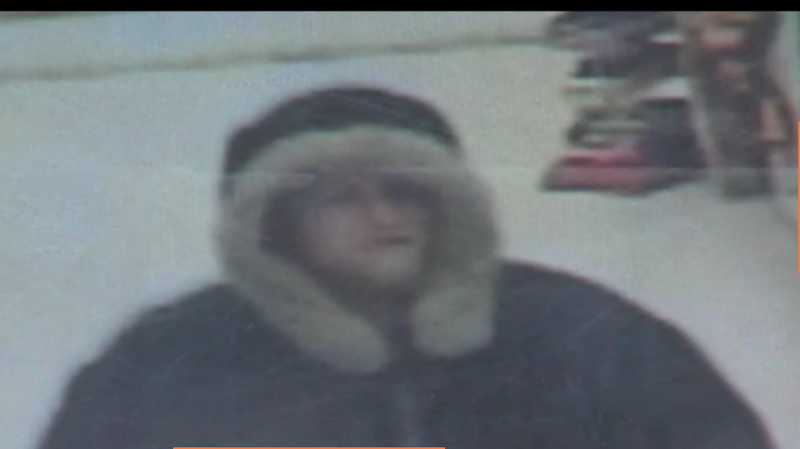 The suspect ran and Patel is seen on video chasing him out of the store. Patel said the suspect’s gun went off as he ran toward the self storage business next door. Patel said he’d do it again if he had to. The robber in this story held up five stores that night, and got money from three of them. 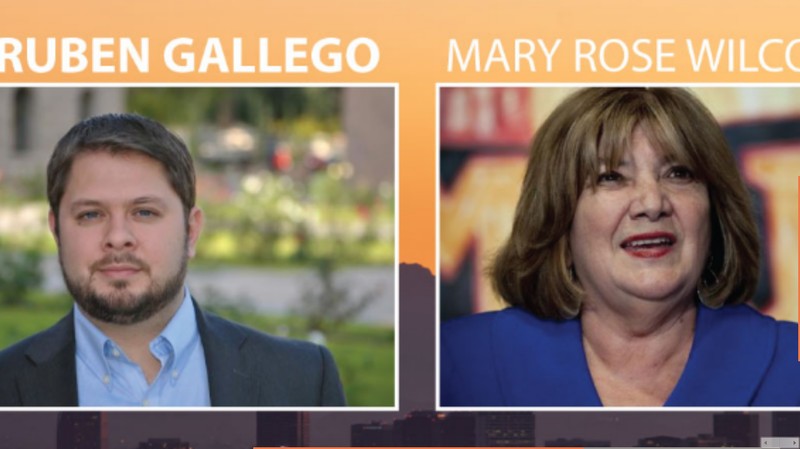 Mary Rose Wilcox is a career politician from Phoenix' South side who runs a Democrat political machine that has been compared to Daley's in Chicago. She was running in the Democrat primary for a congressional seat in the deep blue safe seventh district of Arizona, one of the few Arizona districts that is safe for Democrat candidates. She had name recognition, organization, and money on her side. She decided to differentiate herself from her main opposition, Ruben Gallego, by being more willing to chip away at second amendment rights. Wilcox, who was shot in the hip in 1997 by an angry constituent, has kept gun control front and center during the campaign, although not always successfully. She brought up Gallego's vote at a recent debate; in June, her husband, Earl, confronted Gallego at a gun control rally, alleging that he was a "traitor to the cause." Gallego, a former NRA member, has said he brought a handgun to work at the state capitol after receiving threats, but supports a ban on assault rifles and the county buyback program Wilcox helped to start. Wilcox is not known for subtlety. Many have attributed the fact that she was shot directly to her corruption. In any case, her anti-rights attacks on Gallego did not work. She lost the primary yesterday, 26 August, with 36% of the vote. Her major opponent, Gallego, won with 48%. Interesting enough, in this hotly contested election, which essentially decided who will be representing the "safe seventh" district, likely for the rest of their career, only 24,189 people voted. Being for restrictive gun control did not work for Mary Rose Wilcox. Being perceived as a modestly pro gun rights candidate worked for Ruben Gallego. 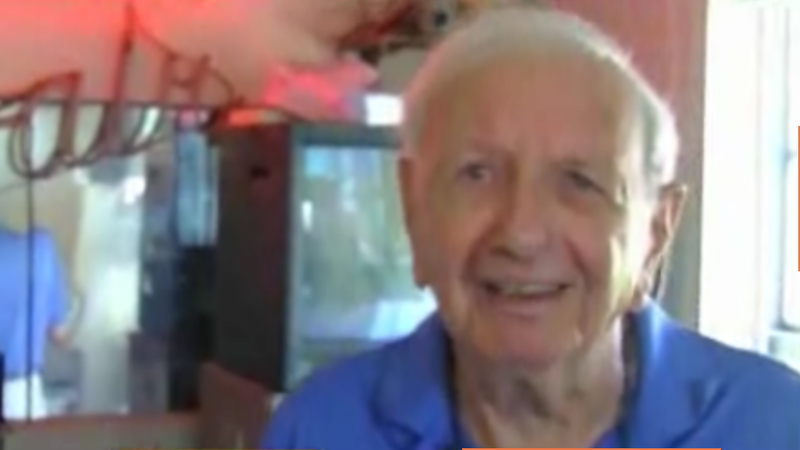 A decorated WWII veteran, who never fired a shot while overseas, won a battle with a robber half his age on Saturday. The hand to hand combat lasted until Arthur M. Lewis and the robber were both exhausted. Lewis had shot the robber six times, four times in the chest, once in the arm and once in the wrist and leg. Lewis himself was wounded with a graze to his left arm. Lewis' girlfriend says that people think of him as frail, but he is anything but frail. Other members of the gun culture would do well to consider Mr. Lewis as an example of grace under fire. His modesty is common among the WWII veterans that I have known. I wonder how many crimes Mr. Lewis may have prevented by aiding in the incapacitation and arrest of Lennard Jervis. The 73-year-old homeowner told KETV NewsWatch 7 everyone was asleep upstairs, when they heard suspicious noises initially thought to be storm related. The homeowner said he grabbed a gun and started walking downstairs, when he saw someone trying to climb through a front window. With the alarm system blaring, the homeowner said he yelled at the intruder to stop. But when the intruder didn't stop, the homeowner said he shot the man. The woman was in her Buffalo City residence near the city ball park about 5 a.m. Friday when two men forceably entered the rear door of the residence, assaulted the woman, and threatened her with a knife, according to the department. The woman fired multiple shots from a handgun at the two men, causing them to flee, the department said. Sgt. Beall says the couple found the burglary suspect locked in a bathroom of their friend's home. They announced that they had guns, and tried to open the bathroom door. When they opened the bathroom door, the suspect allegedly rushed at the homeowners. "He knocked the female into some of the furniture, both the homeowners discharged their weapons, striking the male. 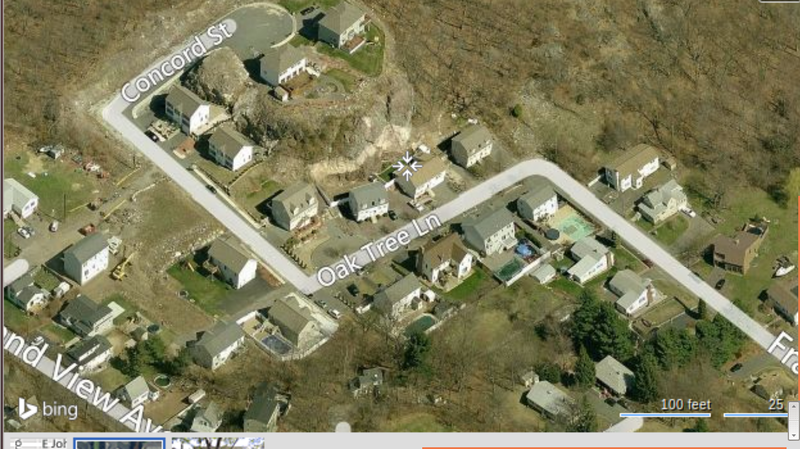 The male was able to get to the backyard, where he collapsed," said Sgt. Beall. The homeowner reported to a deputy that he had been awaken by an audible alarm inside his house for his shop in the 36000 block of FM 1774 and observed the woman at his shop door. He reportedly ordered her to get on her knees at gunpoint, but she and the man who emerged both fled for their car. The homeowner fired at the tire of the vehicle and deputies were able to stop the suspects from fleeing. The woman was also arrested for an outstanding warrant. A 54-year-old Indian woman has killed a leopard using only her farming tools after it attacked her on her way home from the fields. 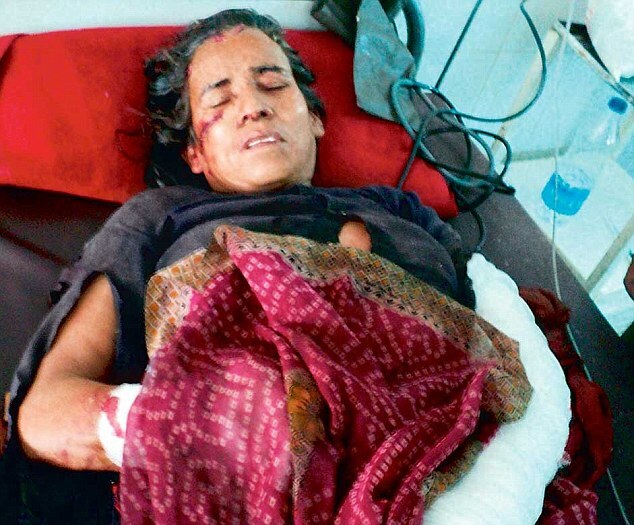 Kamla Devi remains in hospital after a one-hour battle with the predator near her village in Rudraprayag district, Uttarakhand on Sunday. The mother-of-one used a sickle and a small spade to fight off the leopard, after which she had to walk more than half-a-mile before finding help. Melchisedec Williams was woken up on Sunday night when he heard a crash and stomping. The 50-year-old man grabbed his gun, Tampa police said. The intruder, armed with only a knife, had cut the power to the man’s house and broken in through a bedroom window, police added..
After the lights went out and he heard the window crash, Melchisedec accessed his .38 revolver. He tried to determine if the intruder was his nephew, but could only see a shadowy figure with a flashlight approaching him. 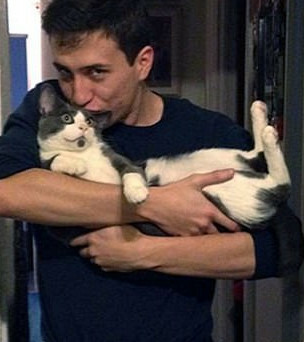 When he did not receive a response, he fired, hitting the intruder in the leg. The intruder then responded, and the homeowner stopped shooting. 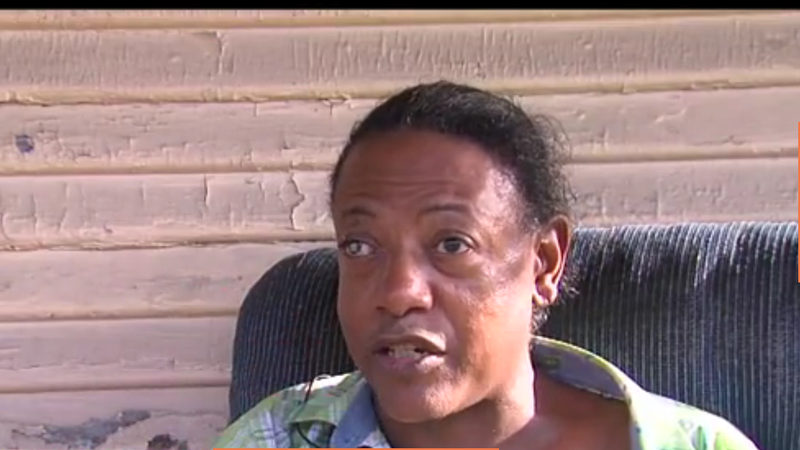 The intruder was his nephew, who, though hospitalized in critical condition, has survived. People who have limited vision often compensate with more acute senses such as hearing. They should not be denied second amendment rights because of their disability. Williams knows that he did what he had to do. No charges have been filed against anyone in the case thus far. The U.S. District Court for the Middle District of Louisiana has struck down the City of Baton Rouge's ban (pdf) on the possession of firearms or other weapons in places that sell alcohol, and their parking lots. The lawsuit was filed under Section 1983. The court granted default judgment to the plaintiff. A permanent injunction was ordered against enforcement of the ordinance, which was passed in 2012. A hearing to determine the amount of damages will be held on October 23, 2014. The facts are clear and undisputed. On October 13, 2012, at about 1:35 a.m., Earnest Taylor was pulled over coming out of Romeo's Lounge parking lot. He was arrested for the possession of two rifles in the back of his car, a HiPoint 9mm carbine, and a Squires Bingham .22. When he informed the officers that he legally possessed the rifles, he was told that there was a "new law". Later the police searched the trunk of his vehicle and found a Yugo 59/66 SKS-type rifle which was also confiscated. Taylor filed suit under 42 U.S.C section 1983. When the City failed to respond after several months, he filed for default judgment. While the lawsuit also cited the claimed damages under the 4th, 5th, and 14th amendments, and under the Louisiana Constitution, the Court only considered the second amendment claims. In JEFF SILVESTER v. KAMALA HARRIS, the United States District Court for the eastern District of California found that the 10 day waiting period to receive a firearm after a background check, was a violation of the second amendment for people who already owned a firearm (and could be shown to do so in the California database), who had a valid CCW license in California, or who owned a firearm and had a Certificate of Exemption (COE). See Edenfield, 507 U.S. at 770-71; Peruta, 742 F.3d at 1177; Valley Broadcasting, 107 F.3d at 1334. Readers should consider the entire ruling to understand the full implications, but it is clear that for people who already possess a firearm, or who have gone through the CCW process in California, the 10 day waiting period is considered as violating the second amendment, if they have passed the background check. Yet, the waiting period only has a positive effect for the government purposes in less than 1% of the people directly affected by the regulation! I know of no studies that show that waiting periods actually reduce crime, and there are studies that show they may increase it. It appears to me, that even under the relatively easy standards of intermediate scrutiny, the government would not be able to show that waiting periods were effective and narrowly tailored to their purpose. CUMBERLAND COUNTY, N.C. – A man accused of trying to break into a North Carolina home was shot and killed early Saturday morning, according to WRAL-TV. 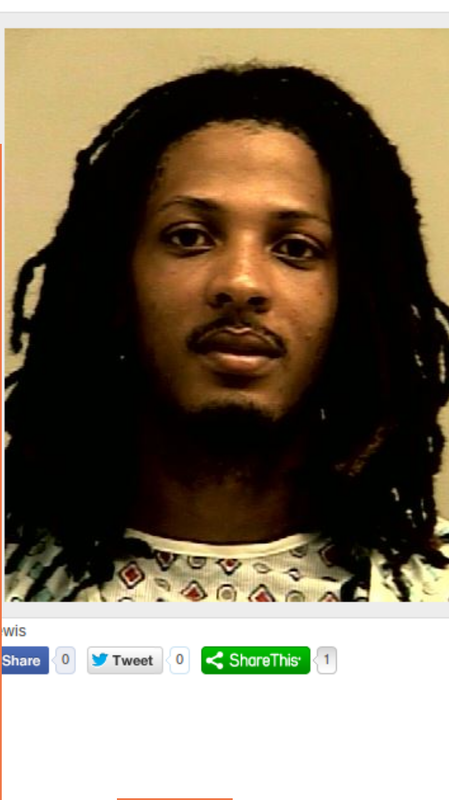 Investigators said they found 23-year-old Theodore Horton shot to death at a home in the 300 block of Brooklyn Circle in Cumberland County just before 2 a.m.
“What do you got for me?” one man said to the victim. He told police he grabbed his attacker’s gun with one hand and drew his own firearm. The man does not have a concealed firearms permit, but carries his gun under Pennsylvania’s open carry laws, police said. The robbers fled. On a dark street, the tactical deterrence offered by open carry may not be as effective, essentially making open carry the equivalent of concealed carry. The open carrier showed good tactical sense in the encounter, and the two criminals were lucky that they did not get shot. This also illustrates the wisdom of those who teach the importance of maintaining your distance when you are holding a person at gun point. Get too close, and you invite a disarm technique. In this case the possibility of the "gun" being a replica, BB gun, or toy might have figured into the victim's decision to use the deflect and draw technique. Wilkes Barre is listed as having a somewhat higher than average crime rate, with 80% of American cities having lower crime rates. One of the major reasons for those who push for a disarmed population to desire the registration of all firearms is that it makes the ownership of the means to self defense contingent on government approval. This is the philosophy that "everything that is not permitted is forbidden", rather than the standard English/American philosophy that "everything that is not forbidden is allowed". It is an enormous difference in perspective. 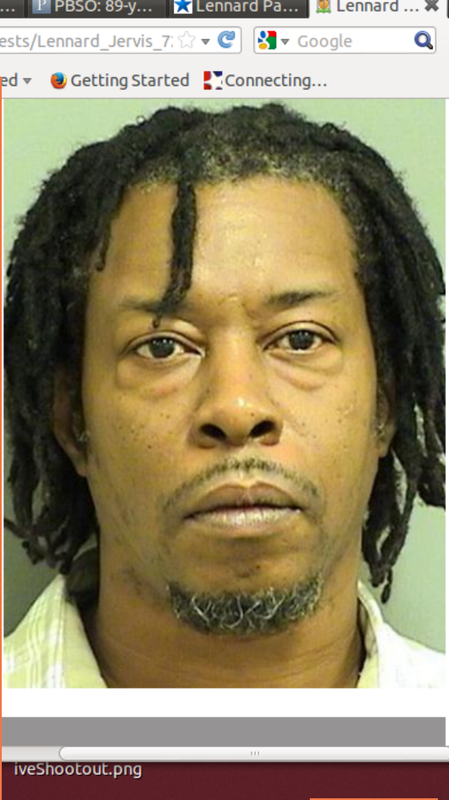 After he was kicked out of the party, he returned to the home with his 50-year-old stepfather and they started striking the residence with rocks and baseball bats, officials said. Once it is clear that ownership is contingent on government approval, then the restrictions on approval can gradually be increased to reduce the number of firearm owners. This is already underway in Massachusetts. It is not clear that Massachusetts requires registration of firearms, but a permit is required to merely possess a firearm. State law used to require permits to purchase or possess firearms be issued for long guns; a recent change in the law now gives judges the authority to forbid possession of all guns if requested to do so by a police chief. The law is very recent, and there will be court cases to clarify it, no doubt. In this case, Mr. Distefano is facing charges because he did not jump through the legal hoops required of him by state law, in order to exercise his rights. If you have to ask the government for permission to do something, it is no longer a right. 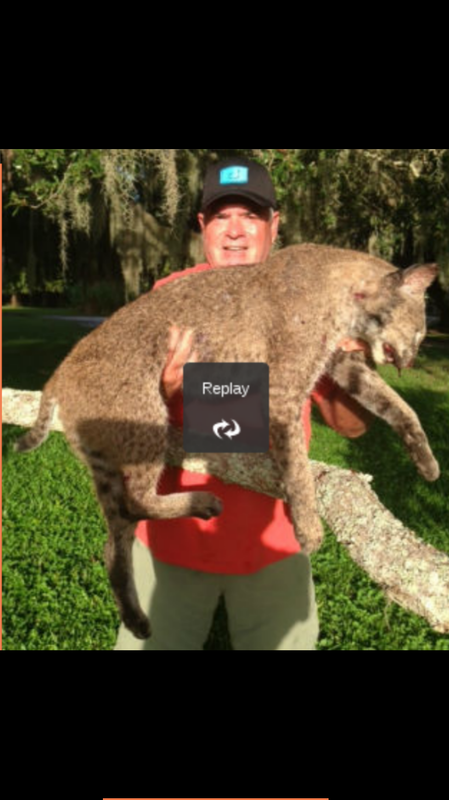 A Florida man demonstrated humans occupation of the top predator spot by shooting a big bobcat that had lost its fear of men. The big cat was killing and eating a chicken a day for a month, and killed the last one just feet from the man and his children. "Saturday evening we were sitting in the hot tub and right there, you see the feather on the ground? The cat came out of nowhere, killed a chicken right in front of us, like 8 feet away. Just splattered blood and feathers right in our face," said Nail. "No fear of man whatsoever." I had a similar, but more benign situation occur at my place in Arizona. A Kit fox wandered near my children and I as we sat in the hot tub just feet away. I have no chickens there, but I wonder if a hot tub might be a good "blind" to hunt from... All you need is a source of power, water, cleaning supplies, mild weather... In my case, the Kit fox was more fun to watch, and represented no threat. A bobcat this big could well be a threat to small children, and 30 chickens are worth considering as well. People gained the top of the food chain through hard work. It is bad policy to allow other species to consider that they occupy the spot. Bad for them, bad for the people they interact with. It appears to be a Benelli 12 gauge, an excellent choice to stop a marauding bobcat. While no loads are mentioned, anything from number 2 shot up would be a good choice. In the comments at the article, one person who has not thought the situation through wishes death for Ronnie Nail. We all die, men, bobcats, and chickens. If the homicidal poster thinks it wrong for Ronnie to kill the bobcat, why was it not wrong for the bobcat to kill the chickens, or for the chickens to kill the bugs and ticks that they eat while free ranging on Ronnie's farm? It is as natural for men to kill bobcats and chickens as it is for chickens to kill ticks. "The whole issue of the public carrying of a firearm is very complicated," Mendelson said. "And I believe the executive and the attorney general will continue with the appeal." Also this week, the city asked the court for six more months to rewrite its gun laws. Right now, the city has until October 22. That's why Mendelson said gun carry will be at the top of the agenda when the city council returns from recess. "What the court said very clearly was that a complete 100-percent ban on anybody being able to get a license to carry a handgun was unconstitutional. But there's a gray area between 100-percent ban and everybody can carry. And that's what we're working through." During the last media push for laws to disarm the population, NRA executive VP Wayne LaPierre said that a good guy with a gun is what is needed to stop a bad guy with a gun. A recent shooting outside the Harry Stone Montessori school in Dallas is a perfect illustration of his point. Dallas Police Deputy Chief Gil Garza said in a news conference the officer was out of uniform and headed to a family function when he saw an altercation. A woman was stopped at an intersection when another car, driven by the suspect, pulled up alongside her. Words were exchanged between the two, then the suspect fired multiple shots into the victim's vehicle. The officer witnessed the shooting, got out of his vehicle, and intervened before he shot the suspect. Gun free school zone laws have been a complete disaster. Mass shootings inside schools have increased four-fold since the laws were passed. This shooting may not have any more connection to a school than the location; however, it does illustrate the insanity of "gun free zones". An attempted car theft by two men in the parking lot of a Kmart in Northeast Miami-Dade backfired on Thursday when a third man showed up and shot at the pair, police said. The Latin means "He who transplants, sustains"
"Why is our bar association taking a position on a matter that has nothing to do with the practice of law?" Hartford lawyer and former Democratic state Chairman John Droney asked in an email typical of hundreds of others inspired by a debate that has continued now for two months. Dubois contends the bar serves the public by permitting experts in its specialty sections to debate and take positions on sharp legal questions. If the association races toward an unpopular, minority position, he said membership can use its referendum right as a restraint. "As one member said to me, what's next?" Dubois said. "Immigration. Obamacare? And I said, 'Yes. All of those and probably more that we haven't even thought about.' All of which have legal implications and all of which may involve a request by one or more of our constituent sections." Anyone who has studied the dynamics of such groups realizes that such a position amounts to a blank check to the leadership of what it can get away with. As the leadership controls a significant amount of the information that the membership receives, this gives it considerable power to influence events outside of the core issues of the group. It was clear that the membership did not support the lobbying effort. Dubois pushed for more. He pushed for an amicus brief to defended the law against an appeal the the 2nd U.S. Circuit Court of Appeals. The "house of delegates referenced is the governing body of the Connecticut Bar. After listening to entreaties by past association presidents and a lawyer who also is a Newtown selectman, the house of delegates voted 34 to 15 to join with the Brady Center to Prevent Gun Violence in defense of the law — in spite of signs that a substantial portion of the membership might be opposed. Among the signs: A straw poll showing opposition was running 4-to-1 in one of the association's biggest sub districts, Hartford. But the gun culture has developed its own media that act as a check on the ability of others to shape the narrative. This is well documented in Professor Brian Anse Patrick's book "Rise of the Anti-Media". On Aug. 5, lawyers opposed to joining the Brady defense had collected sufficient petition signatures to force a referendum. Dubois said he cannot recall that happening during his 40 years as a bar member. The irony is thick. This response by the person who said that if the membership does not like what we do, they can "use their referendum right", knowing full well that it was nearly impossible to do so. The final vote announced Wednesday afternoon was so close that CBA President Mark Dubois wrote members, "I am ruling that the referendum vote will be called as tied. I do not feel that the best interests of the CBA would be served going forward without a clear and empirically defensible result. Accordingly, I have decided not to sign the brief prepared by the Brady Center in support of the Appellee in the matter of Shew v. Malloy." I wonder what the actual vote was. Mr. Dubois must have released it to the membership. Some might wonder if Mr. Dubois would have given this response if the vote were in his favor. You would think that the robbers would learn that Tick Tock Watches is not a good choice of targets. Maybe they do not read the papers; maybe they think they are different and smarter; maybe they just cannot resist that high grade bling. I would not want someone who had escaped the communist takeover of Vietnam to be shooting at me. The police in Philadelphia have not yet made a determination if the shooting was justifiable or not. Labeling the criminal as the "victim" may be premature. The shooter was being questioned by police. Philadelphia police commissioner Charles Ramsey says they’ll gather all the info and then the district attorney’s office will have to decide if charges are warranted. Sgt. Gary Harrison says during that home invasion, the man who lives inside the apartment shot one of the suspects in self-defense. That young man was airlifted to Ben Taub Hospital. Harrison tells us there were three suspects involved. One other was taken into custody. The third fled the scene once gunfire erupted. 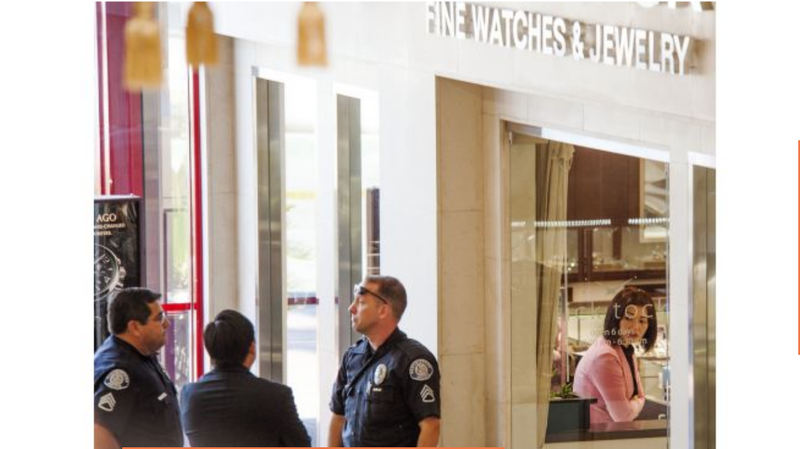 When the gunman slammed a gun on the counter and pointed it at the woman, she immediately ducked behind the counter and covered her head, according to police. When the woman’s husband saw what was happening, he drew his own weapon and pointed it at the gunman. The gunman then swung his weapon around, pointed it at the clerk's husband, and then fled out the door. No money was taken during the incident. Moments later, however, she heard glass shattering and then the pottery she placed in front of her backdoor breaking so she grabbed her gun. According to the report, Douglas stayed in the bedroom but she “could see light from a flashlight getting closer from under the door. When she heard the doorknob turn, she fired one shot through the door. It appears to me that the necessary conditions are met for paragraph (3). Suspect Jaime Lewis turned up at a medical center with a bullet wound to the chest. I also believe that the woman enjoys good relations with the local police department. She was at the police department parking lot, handing out snacks, when reporters approached, and she left. A person, even in a no-shooting zone, still has the right to defend their person or their property,” Golik said. “In this case, based on the facts, there is a reasonable argument that Mr. Barton may have been defending his person and property when he fired in the air. Barton said the obstruction charge also is groundless. The obstructing charge has not yet been made. 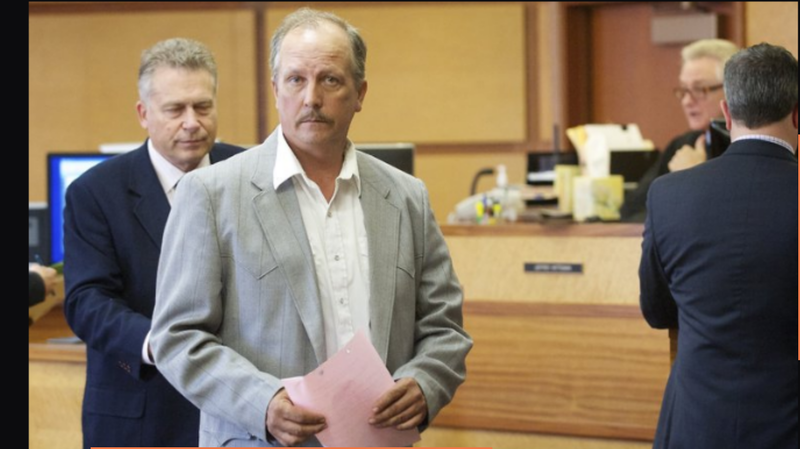 Mr. Barton pled not guilty to the charge of illegally discharging a firearm in July of 2013, over a year ago. 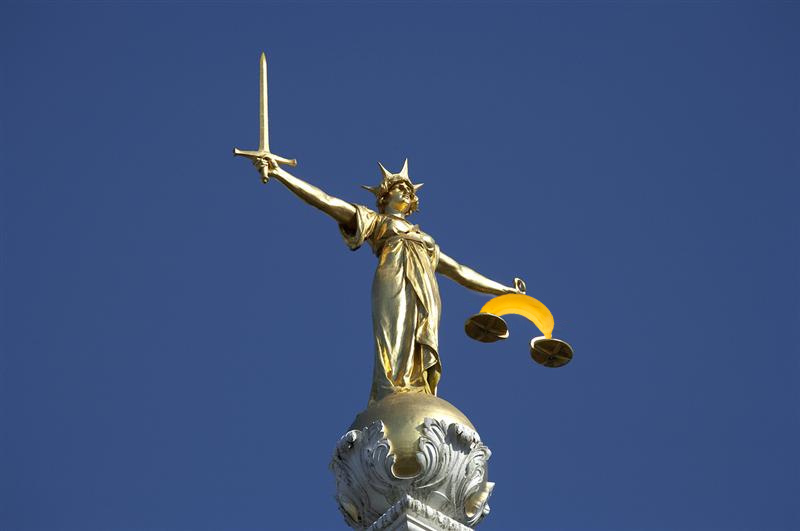 Prosecutors have enormous power, and significant immunity. It may not be enough to shield Clark County Prosecutor Tony Golik in this case. According to a news release from the New Orleans Police Department, a 28-year-old man and his 36-year-old wife were sitting on their backyard patio when a masked gunman approached and demanded money. They say the gunman ordered the couple into the home where three female children, ages 6, 13 and 14, were inside. That's when, investigators say, the husband retrieved his gun and shot the suspect, fatally wounding him. The gunman was pronounced dead on the scene. The teens ordered her into the house. Once she was inside, she ran into her bedroom, put her child on the bed and grabbed her gun, the report says. She walked into the living room where the teens were standing and started shooting, prompting the teens to run out the door. When Thomas Ostermann came face-to-face with two burglars in his screened-in pool, he grabbed his gun to protect his property, said the deputy's report. "They both fled. One of them ended up in my pool and I tried to keep him. He broke loose (but) I got his shirt," Ostermann told the dispatcher. "The one that got away -- I don't know whether he dropped it or not -- had a crowbar." A man shot one of two would-be robbers who entered his apartment Wednesday, critically wounding the intruder, the Broward Sheriff's Office said. "The robbery kind of got turned on its head when the occupant started shooting at the robbers," sheriff's spokeswoman Gina Carter said. Witnesses tell San Antonio police two men broke into an apartment unit by breaking down a door, but someone inside the apartment opened fire on them. The men attempted to run, but one was shot several times, San Antonio police said. 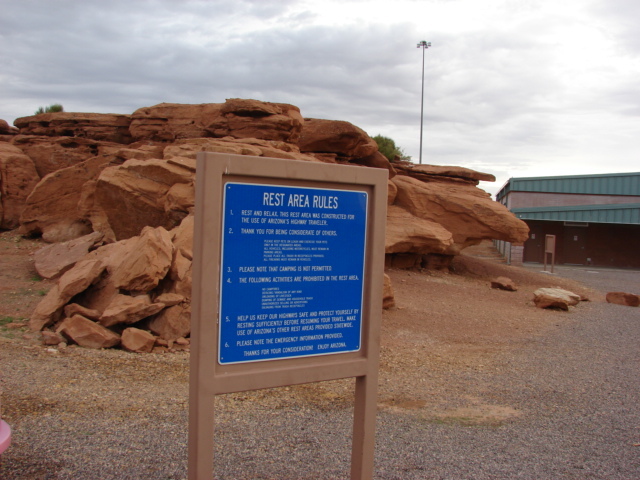 In a previous article I wrote about the improper signage at the Meteor Crater rest stop in Arizona. At the first stop, I failed to obtain a picture. 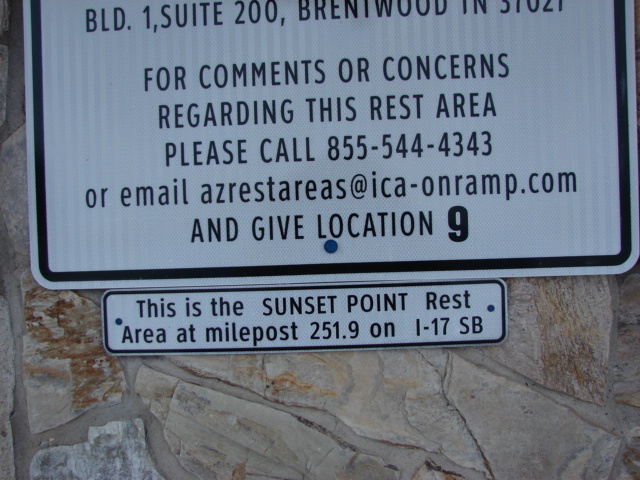 The rest stop is a member of a pair of rest stops as is often seen; one on each side of the freeway. 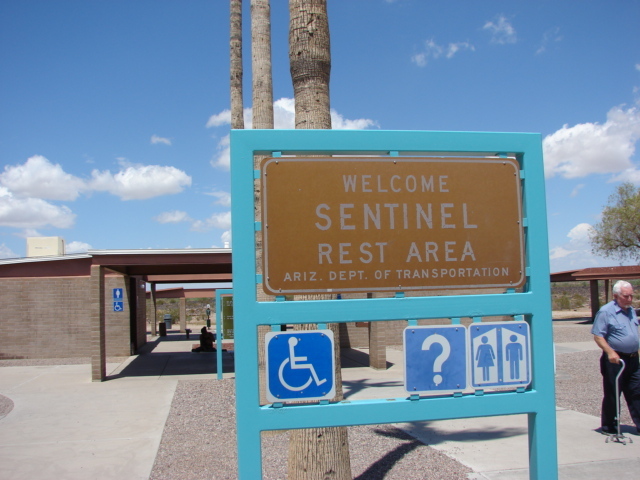 On the return trip, I stopped at the sister rest area to see if it had the bad signage as well. It did. 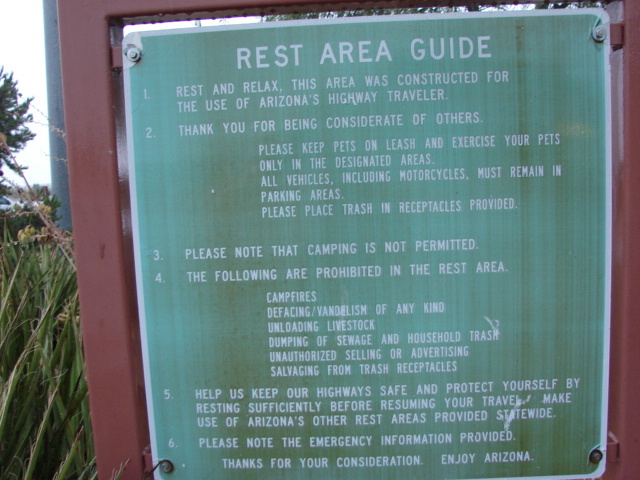 The sign appeared to be identical with the sign that I recalled on the South side of I-40. 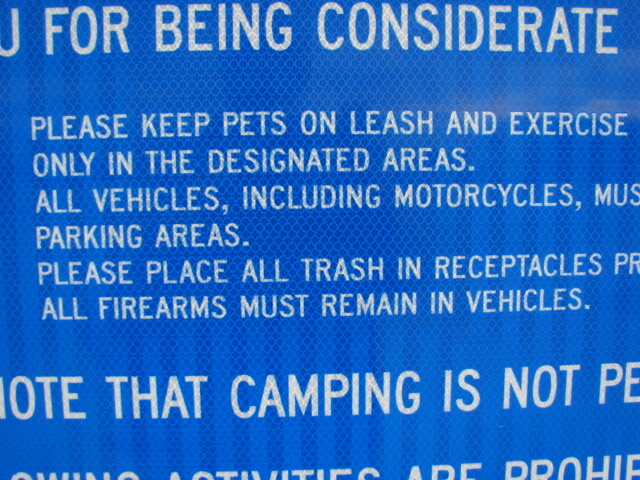 Note the location of the prohibition on carry of firearms in the rest stop, under the "PLEASE PLACE ALL TRASH IN RECEPTACLES" line. You can see that the signs appear to be quite new, with no weathering. Interesting that the "trash" line is a request, but the firearms line is a command. 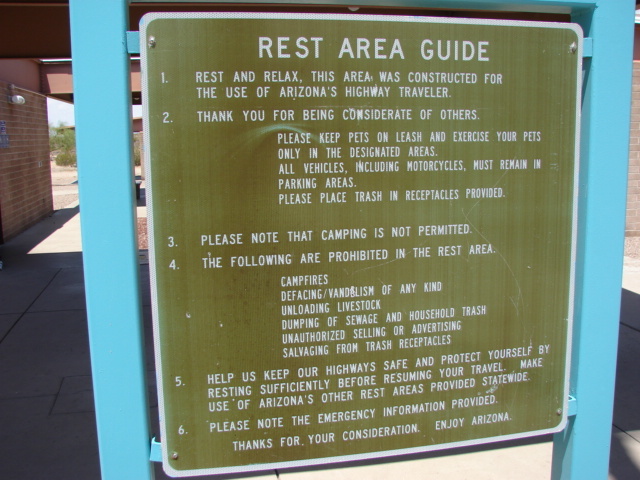 Have you noticed that there are no longer any signs at Arizona rest stops that read, "Keep all weapons in your vehicle"? That was Brassroots and S.A.F.E. combine effort back in 1998. We staged a forty-man protest at the Sacaton rest stop and five TV cameras showed up. We then got three hours of time on Bob Mohan's show on KFYI. That resulted in Hull's, ADOT's and DPS's phones melting down for two weeks. The signs came down later that month. Notice the clouds in the top picture? The weather got worse as I approached Flagstaff. By the time I was heading south on I-17, the rain was falling consistently. The "scenic view" stop before the McGuireville rest stop did not have a sign. 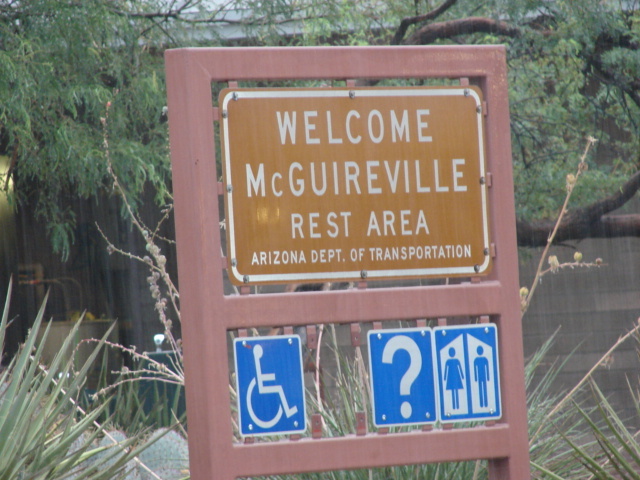 The McGuireville stop did. See the space after the "PLEASE PLACE TRASH IN RECEPTACLES..." line? That is where the offensive firearms prohibition was painted out. 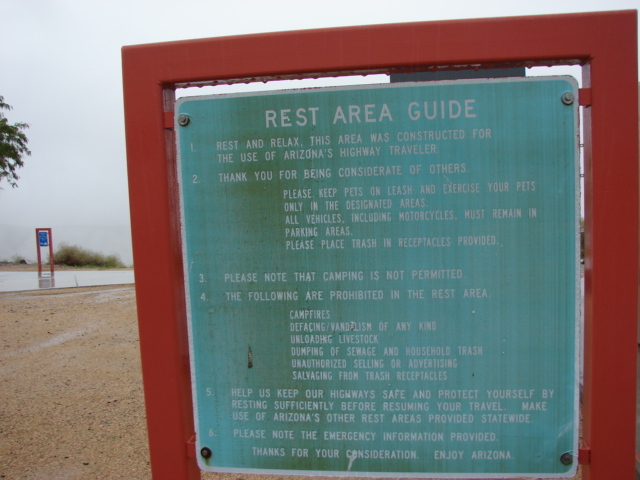 The fading on this sign shows that it is much older than the ones at Meteor Crater. No firearms prohibition here, either. Visibility was very restricted at this point. I picked up a stranded bicyclist, huddled in a doorway, wrapped in a space blanket. The stop was locked up because the power was out. We threw the bike in the back of the truck to get him down off the mountain. I gave him my card. I saw two more wrecks by the time we got down. In some places, one inch gravel was washed across both lanes. Sometimes the water was over two inches deep on the pavement. I later found that rain totals of 3-4 inches were common in the area. To compound the difficulties, windshield wipers dry rot rather rapidly in the Arizona desert, and are often neglected because they are used so seldom. Fortunately, I had replaced mine for the cross country trip. We made it down without further incident, and I dropped off my passenger where he could catch a bus for himself and the bike. Just a few miles into the foot hills, the rain had stopped, and we drove out from under the cloud cover. By the time I reached Gila Bend, the radio announced that I-17, both North and Southbound, had been closed due to weather. Same story: no prohibitions on firearms on this weather beaten sign. Same blank place for the offensive language. I will be posting updates as the situation develops.